Yesterday, Firefox Announced New Updates To iOS Version Of Firefox Browser And Firefox Focus Which Launched In June This Year. Those Firefox Users Who Are Running iOS 11 On iPhone And iPad Will Now Have Automatic Ad And Content Blocking With Private Browsing Mode Mozilla Said In Its Blog Post. Automatic Content And Ad Blocking In Private Browsing Mode, While Update Brings Tracking Protection Option Is Normal Browsing Mode. Newly Added Feature Uses The Same Ad Blocking Technology Which Mozilla Already Using In Firefox Focus-Privacy Browser, Firefox For Android And On Desktop. 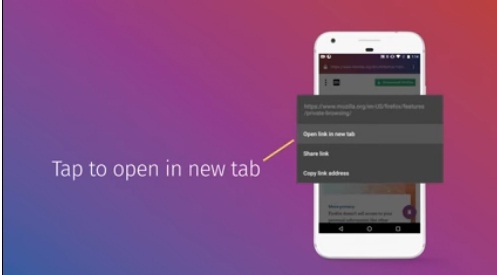 Firefox Focus One Of The Fastest Growing Browser Which Is Really A Privacy Browser Is Getting Multiple Tabs Support. Previously, Only One Web Page At A Time Can Be Opened, Which Means No Tabs. With The New Update, Focus Users Will Be Able To Browse Multiple Web Pages At The Same Time As New Update Is Getting Multi-Tab Support. All You Need To Open A New Tab Is Hold A Link On Current Web Page And Choose Open A New Tab. Tap On Floating Icon And Access All Opened Tabs. Firefox Focus Already Have A Lot Of Features Like One Tap History Clear, Fast, Light Weight, Ad Blocking, Tracking Protection. With New Update, It Will Be More Useful. You Can Download Firefox Focus From Here(APK Mirror) Or Update Directly From Google Play Store. These New Updates Are Rolling Out To You Very Fast.